A sparkling fleet of groundbreaking zero-emission electric buses has been unveiled in Harrogate. 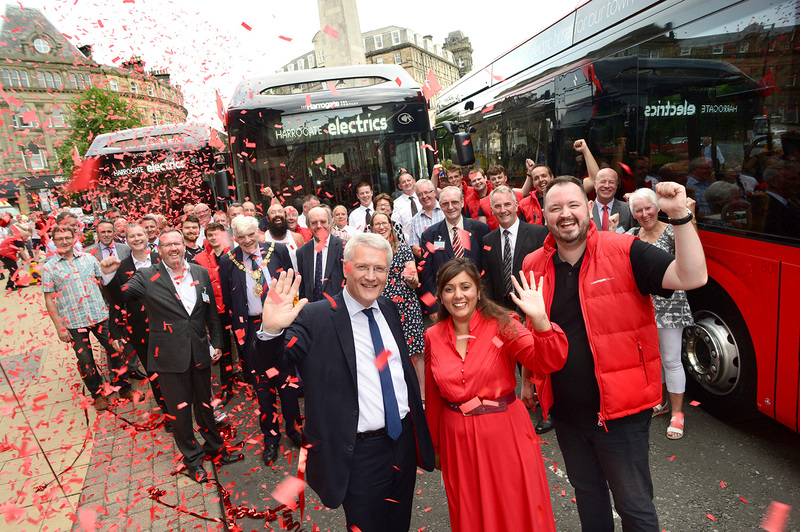 Transdev subsidiary The Harrogate Bus Company revealed the fleet of eight Volvo 7900e electric buses at a star-studded launch event in the North Yorkshire spa town on 26 July, attended by the Buses Minister, Nusrat Ghani MP, and local MP for Harrogate and Knaresborough, Andrew Jones MP. It’s the first application of ‘opportunity charging’ technology to be implemented in the UK. 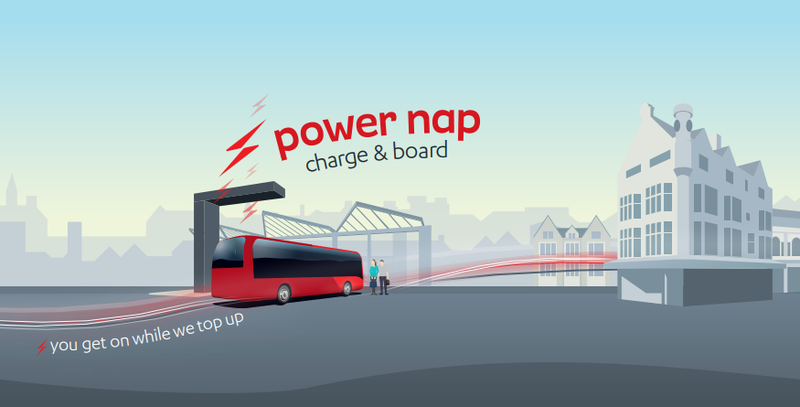 Unlike typical electric buses, which need to be plugged in overnight and are often out of juice by lunchtime, these innovative new buses will charge between trips, taking around 6 minutes to fully charge by taking power from one of three masts now in place at Harrogate’s bus station. 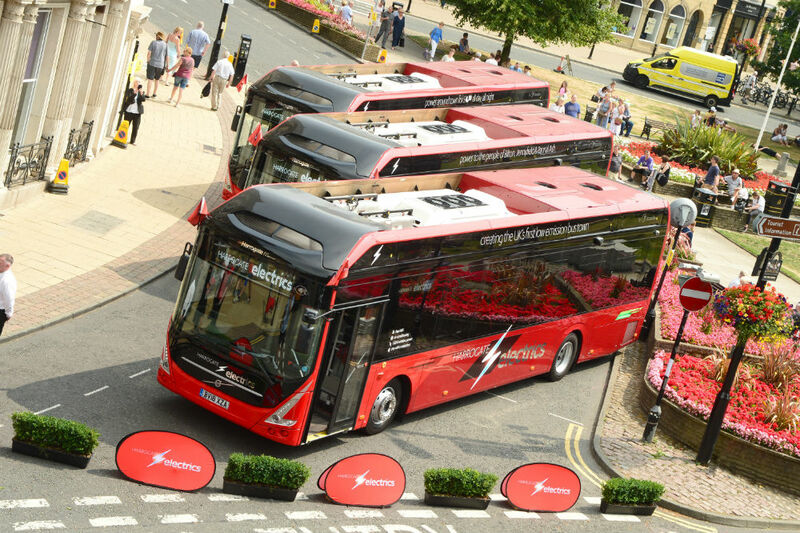 Transdev has invested £1.7million in 8 of the high-spec electric buses and infrastructure, together with £2.25million of funding granted from the Government’s Low Emission Bus Scheme. 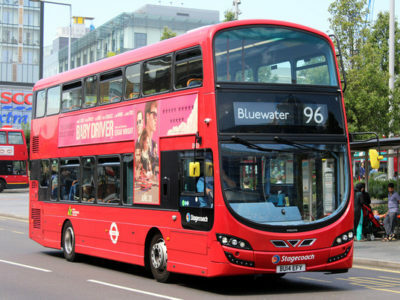 And, as you’d probably expect by now, these are no ordinary buses. Every tiny detail has been obsessively considered to almost fanatical levels. Aside from the revolutionary OppCharge technology, the vehicles feature a highly bespoke designer livery and interior, produced in collaboration with industry-leading design agency, Best Impressions. Inside, you’ll find Blazefield’s sumptuous designer moquette, complemented with tasteful uplighting, a cavernous interior devoid of handrails (bell pushes are mounted to the sidewalls instead), full colour next-stop info screens, air conditioning, and huge, separate bins for rubbish and recycling (how come nobody ever thought of that before?!). There’s a series of intricate illustrations to be found on the interior cove panels, reflected also in the publicity material and timetables, to the rears of each bus and beyond. 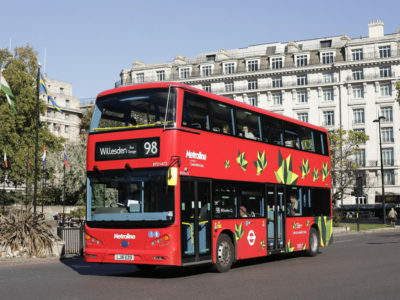 Each vehicle also features the usual array of things you’d now expect to see on any high-spec bus in the UK – free WiFi, USB power, contactless payments, and audio-visual next stop announcements. On the outside, the extra real-estate afforded by that high roofline of the vehicles has been fully utilised. There are some simply stunning little details to look out for, from the silver flash tastefully extending the headlight surround mirroring the electric bolt of the logo, to the polished chrome logos and flashes towards the rear. The new buses are part of Transdev’s ambitions to turn Harrogate into Britain’s first ‘Low Emission Bus Town’. The company envisages that every bus in its fleet will be either zero emission or Euro 6 – and this technology brings it one step closer to that goal. 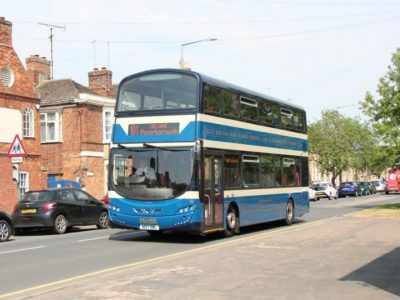 Transdev was one of only 13 organisations across the country, and the only one in Yorkshire, to bid successfully for finance from the Government’s Low Emission Bus Scheme towards the cost of the buses and infrastructure. 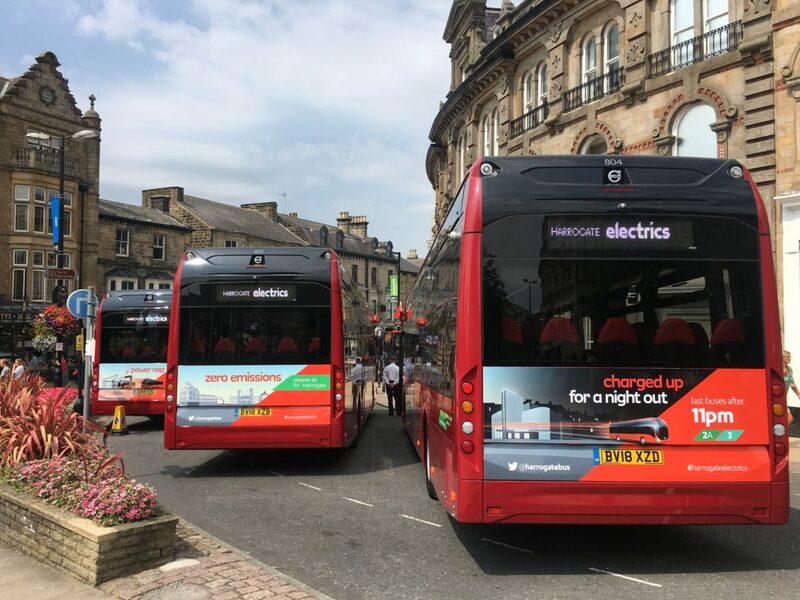 What do you think about Harrogate’s new electric buses? Let us know in the comments below or tweet us @transportdsn.